South African pork prices have fallen more than a third in recent months, as demand for processed cold meats tanked in the wake of the deadliest outbreak of listeria in history. Cheaper pork will add to downward pressure on food prices, which have been slowing on expectations of a solid maize crop, helping to pull inflation in Africa’s most industrialised economy down to seven-year lows. The government traced the listeria strain responsible for the outbreak to polony from a factory owned by Tiger Brands. 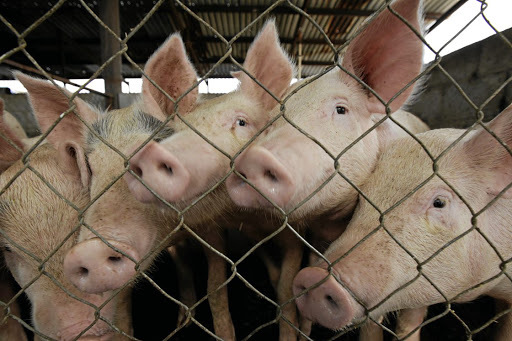 “The pork industry unnecessarily suffered a severe blow following the recent outbreak of listeriosis,” said Paul Makube, senior agricultural economist at FNB Agri-Business. The outbreak is expected to have caused around R1bn in losses to the pork value chain so far due to the changes in consumer perceptions of pork, Makube said. Annual turnover in the pork industry is around R5.3bn and accounts for 5% of the value of livestock output. “Even though demand for processed and cold meats fell sharply due to the health and safety concerns from the listeriosis outbreak, pork farmers have now had to redirect the pigs for the fresh meat market,” Makube said. This has effectively flooded grocery shelves with pork chops and hams, pushing prices down. Half of the pork industry’s meat is used in processed products, South African Pork Producers’ Organisation CEO Johann Kotzé said. Producer prices of pork have fallen more than 36% since early January to R20.15 per kilogram amid low demand, said Makube, adding that this is expected to last up to six months. “Pork was never directly implicated but because of our participation in cold meats, people perceived that,” Kotzé said. The Department of Health in March ordered a recall of cold-meat products including polony, prompting a clearing of shelves by retailers. Listeria, which is usually found in soil and water and some animals, can cause flu-like symptoms, nausea, diarrhoea and infection of the bloodstream and brain.